that opens from one mind to another. for fitting the window, or the latch. ~ Rumi, "Night and Sleep"
First, could we please have a heave-ho old fashioned whooping cheer for the miracle that occurred in Thailand a few weeks ago – the daring Tham Luang cave rescue. Seriously, hip hip hooray. Now nobody in their right minds would ever want a group of young boys and their coach to suffer the ordeal the Wild Boars football team endured. But as the old adage advises, “Every cloud has a silver lining,” the silver lining of this very dark cloud was that we got to observe one of the most brilliant examples of Soulful LeadershipTM in action. 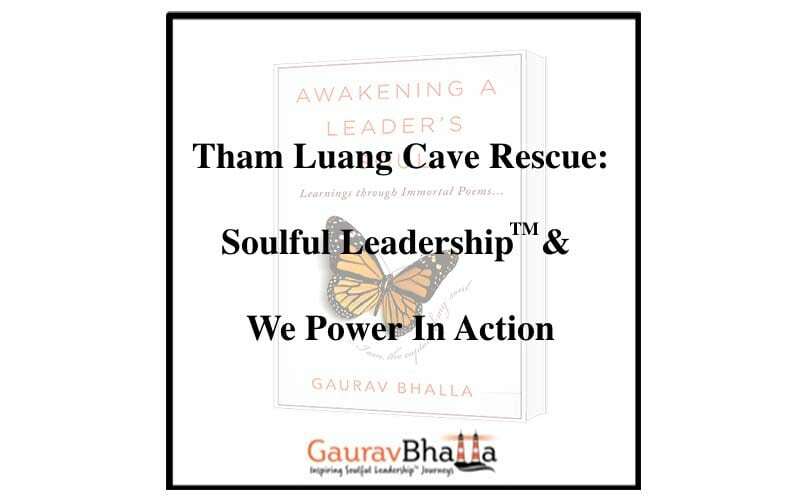 Here are a few reasons why the Tham Luang cave rescue mission should be added to the Soulful LeadershipTM leadership development curriculum of B-Schools and Organizations. First, it takes a truly “big” leader to say, “I don’ know, we need help.” The Governor of the Chiang Rai province, Narongsak Osottanakorn, and the rest of Thailand’s government were quick to realize that they didn’t have all the knowledge or skills required to carry out the rescue mission, and courageous enough to convert that realization into a call for help. There was no talk of how this would reflect on Thailand, just the desire to take action to fill the knowledge and skill gaps as quickly as possible. Second, throughout the entire operation egos were kept under strict lock and key. Yes, the operation flourished because of the absence of super-sized egos. Want confirmation, take this pop-quiz. How many different countries were involved in the rescue effort? What were the names of the divers who found the boys? Which country were they from? Who or which group devised the master plan for rescuing the boys and their coach? Who was directing the rescue mission? (Was anybody really directing the rescue mission, or was a group coordinating it?). The mission was not about “I.” The focus was always on getting the boys out of the flooded cave as safely and quickly as possible. And it was always a “Nobody WE” who were in charge, not a “Some Big Shot I.” In fact, the only ego who tried to get in the room was Elon Musk and his little submarine. And how he flared, when he was denied the spotlight? Next, and related to the point above, there was no vulgar credit taking after the rescue. No one diver, or group of divers tried to hog the media coverage after the rescue. It was collaboration at its best, because even the best divers in the group knew they couldn’t have done it alone. But perhaps the most singular aspect of the rescue mission was how the divers credited the moral and physical courage and fitness of the boys and their coach for the success of the rescue mission. The coach and the boys would have none of that and passed on all the credit to the hero divers, including the one diver who lost his life during the rescue mission. Last but not the least, the coach’s actions – his fortitude, his personal sacrifices, his calm handling of the boys and the situation – are the tour de force of this inspiring Soulful LeadershipTM journey. It was not his fault – but he accepted full responsibility, and he apologized to the boys’ parents. He ate last, and then too very little, so the boys could eat. And most importantly, he inspired and guided the boys to dig deep, taught them meditation, which helped them stay calm, and hopeful, even in the face of the darkest odds. Remarkable. Truly remarkable. And hip hip hooray again for this silver lining of Soulful LeadershipTM in action. Let’s all learn from it, because the world needs more Soulful Leaders who are willing to put their egos aside, who are willing to forego credit, who are willing to learn, listen, and collaborate so they can increase the wellbeing and prosperity of the greatest many, not just cater to the power and prestige of the privileged few.